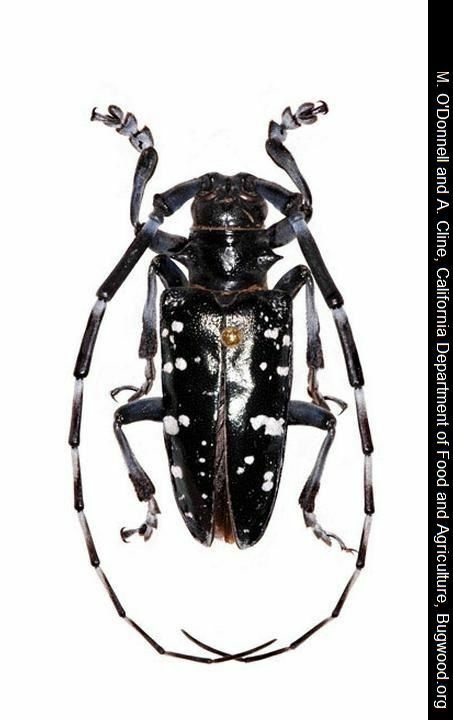 Asian longhorned beetle (Anoplophora glabripennis) is a foreign wood borer that is originally from China and Korea. It is not known to occur in Iowa; however this pest is one that would deserve our utmost attention if it were accidentally introduced through firewood, logs, or other unprocessed wood products being moved from quarantined areas. Several infestations of this pest are located in port cities where international shipments from Asia enter the United States. The beetle has potential to travel long distances if undetected. In the United States where this beetle was accidentally introduced, the beetle prefers maple species (Acer spp.) including boxelder, Norway, red, silver, and sugar maples. Other preferred hosts are birches, Ohio buckeye, elms, horse chestnut, and willows. Occasional to rare hosts include green and white ash species, European mountain ash, London planetree, mimosa, and poplars. 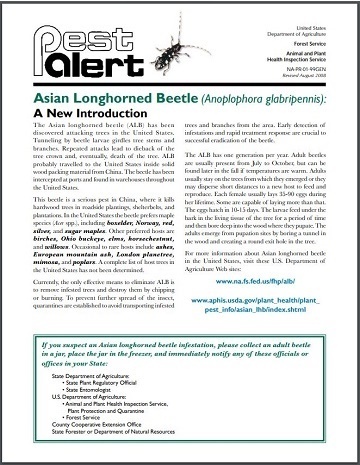 If you live in Iowa and suspect Asian longhorned beetle as a new introduction to your area, please contact us, and we would be happy to take a look. Where is Asian Longhorned Beetle? Asian longhorned beetle is considered to be a serious pest in Asia where it kills hardwood trees, and damages shelterbelts and roadside plantings. This beetle is a threat to a wide variety of hardwood trees and forest areas, and an accidental introduction and establishment of Asian longhorned beetle would likely result in significant economic, environmental, and social impacts for our Iowa communities. ALB was thought to have been introduced to the United States through wood pallets and packing material from the beetle's native home areas of Asia. Asian longhorned beetle infestations have been found in several port cities of the United States and Canada since 1996. 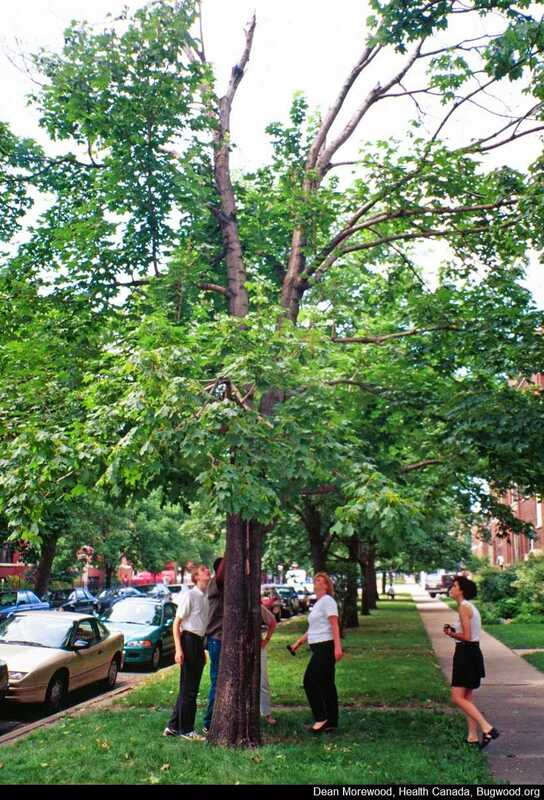 There have been several successful eradicated areas where Asian longhorned beetle was found in New York and New Jersey; however the battle continues on several urban fronts where the concern is the pest could enter natural and managed forest areas of Eastern North America. Currently the only effective means to eliminate ALB is to remove infested trees and destroy them by chipping or burning. Insecticides have also been used to prevent new trees from being infested in areas where the beetle is known to occur. To prevent further spread of the insect, quarantines are established to avoid transporting infested firewood, logs, and branches from areas where Asian longhorned beetle is known to occur. Early detection of infestations and rapid treatment response are crucial to successful eradication of the beetle. It was first detected in 1996 in New York City, NY and has also been found in several urban areas of the northeastern United States. The most recent find of Asian longhorned beetle was during 2011, where it was found in Clermont County east of Cincinnati, Ohio. All known infestations of this pest are being eradicated by Federal, State, and City authorities. 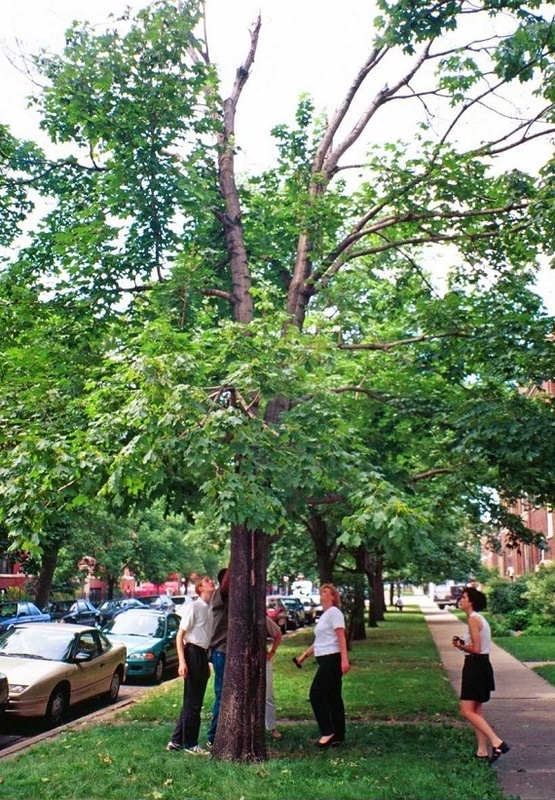 Asian longhorned beetle was also found in Chicago, IL during the summer of 1998, and was declared eradicated from this city in April of 2008 after four years of negative surveys. This successful eradication is due largely because of cooperation between property owners, the city of Chicago, State, and USDA workers. It continues to be the example to strive for in other infested areas. 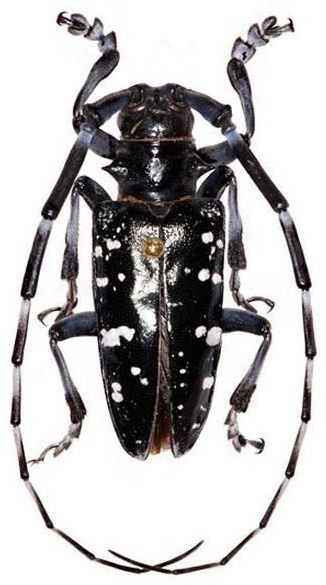 Asian longhorned beetle was first discovered in the United States in Brooklyn, New York in August 1996, and has since been found in other areas of Long Island where eradication continues. ALB was later detected in Chicago, Illinois in July 1998. Federal, State, and City authorities took part in a cooperative strategy to eradicate the pest, which included public awareness programs to educate people about the threat, as well as removing all infested trees. In October 2002 the beetle was found in Hudson County, New Jersey. It was also found in Middlesex and Union Counties, New Jersey in August 2004. 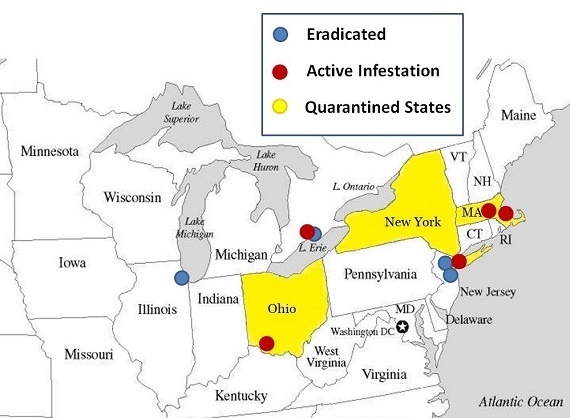 The pest is currently being eradicated in these areas. In 2008 after the completion of control and regulatory activities and following four years of negative surveys, Asian longhorned beetle was declared eradicated in Chicago, Illinois and Hudson County, New Jersey. In August 2008 ALB was discovered in Worcester County, Massachusetts. It was also found in Suffolk County, Massachusetts July 2010. These locations are currently eradicating the pest. Most recently in June 2011 Asian longhoned beetle was detected in Clermont County, Ohio east of Cinicinnati. Eradication of the pest is ongoing.